"i'm researching and trying to get a new-old bike. 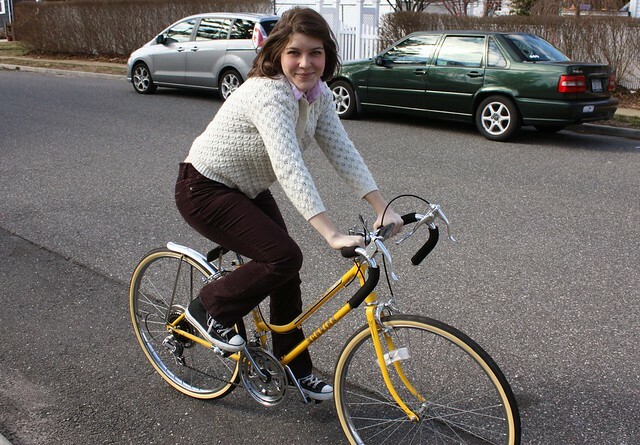 a schwinn collegiate in yellow. its exciting for me since i havent had a bike of my own in years. its gonna need new tires, but its reasonably priced. or a girls collegiate 1980 schwinn in blue which im leaning towards because its not a boys bike and will prolly be more comfortable." Well kids, my dream has come true. 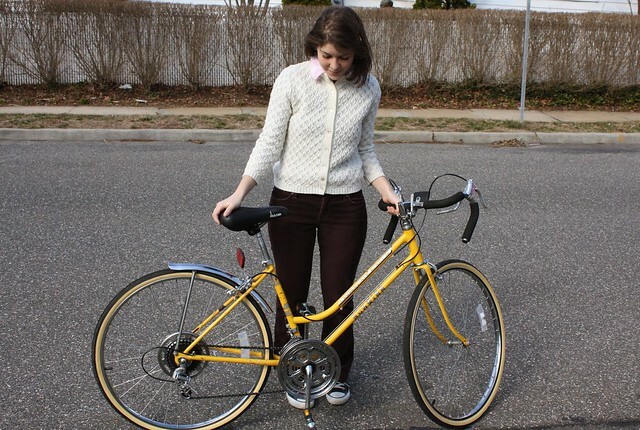 Rich found and refurbished a women's 1979 Schwinn Collegiate and gave it to me for my birthday. On Sunday afternoon he took me out to learn how to use the old-school gears and how to not fly over the handlebars. This is true love; I can't wait to ride it every single day until it starts snowing next winter. If you see a yellow blur flying past you, it might just be me and my new ride. EDIT: I did some math *gasp* and bikes now outnumber people in my house 3.5:1. Hoarders is about to come a-knockin'. What a sweetie - keep hold of him! um best present EVER. yellow is my true love and that bike is a beauty. i have a schwinn traveler in blue with modified handlebars--it's a gem! Psst. That bike looks great on you. Congrats on the bike - I love it! So cute! So amazing how you got your dream bike after all those years! Lovely bike. I think I have bike-envy. You know what would make it even more awesome...a lovely leather Brooks saddle. Well worth the investment. (http://www.brooksengland.com/). How cute is that bike I am a big fan of the colour as well. Awesome! It was a long wait but you deserve it. What a nice bday present! Aw, that is such a cute bike! OMG! She's beautiful!! I love her vintage feel. See ya on the road, buddy! Looks awesome! My mom has an old bike hanging up in the shed...I might have to go take it down this spring! It's blue and looks beautiful! I think it's a Schwinn, too! You're going to have a lot of fun this season. :) And I'm digging your Converse, too. My favorite shoes! that bike is perfect! old bikes are amazing and have that vintage air that we all love. wonderful present. so sweet. And just in time for summer. aww old schwinns are great!! !